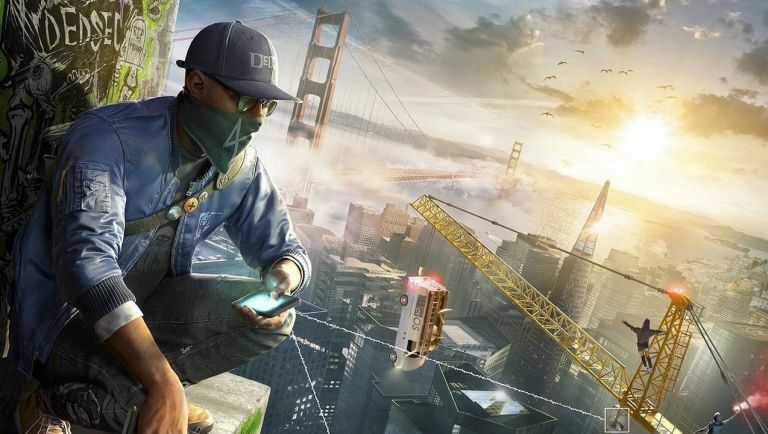 With the dog firmly leaked out of the bag (we're pretty sure that colloquialism got the better of us), Ubisoft has officially announced Watch Dogs 2 and revealed a server full of new details on the dystopian sandbox sequel. As new protagonist Marcus Holloway (no sign of the first game's personality void, Aiden Pearce), you'll now have muhc of the creative freedom we all hoped for with the original game. For a start, you can now hack practically everything - cars, cameras, drones and robots are all at your mercy. The idea is this - if it has a chip, you can hack the hell out of it. For instance, cars are now hackable and can be controlled remotely, adding a new edge to combat and distractions during more dynamic playthroughs. You can still hack phones for cash and info, but you can also use phones as a distraction - in fact, you can now break into multiple phones and devices at once. Gear wise, new guy Holloway isn't going into a fight with just his phone and a gun (which are all now 3D-printed and customisable in-game - this is so 2016), he's now packing plenty of gadgets to give you a new edge in combat and infiltration. There's a remote control RC car (complete with an extendable arm for cheeky keypad access), a drone (more aerial recon and shenanigans) and a new cue-ball melee weapon that enables you to whip enemies into submission quickly and quietly. Dedsec, the vigilante hacking group from the first game that served as both as allies and enemies in the original game, also returns. It's now more like a cool kid's club, with your hacking exploits earning you followers. Think an XP system with a 2016 twist and you're not far off. Watch Dogs 2 will arrive on PS4, Xbox One and PC on 15 November. You can pre-order it in a variety of versions, including a U-Play Shop exclusive Collector's Edition even includes an app-controlled, bin-shaped robot complete with 15 phrases and 10 'emotions'. It'll set you back a cool $149.99.